Currently browsing posts filed under "Junior Advisers"
Future of the JA System in Doubt? I would not be surprised if the JA system disappeared in the next decade or so. 1) Would people like more coverage of this topic? There have been a bunch of Record articles over the last few years, but they are no longer easily available. JAs, although connected/watched/supported/supervised by Williams, are given more freedom than their peers at other schools. 3) In her talk with alumni volunteers yesterday, Dean Marlene Sandstrom mentioned the recent problems with too few JA applications, and with too few applications for other leadership positions as well. She attributed much of this to students who felt (and whose families felt) that the College should not be asking them to do so much without paying them for their labor. She also mentioned that the College, although it does not “pay” JAs, does release JAs on financial aid from their on-campus employment obligation. 4) The College’s bureaucracy continues its endless growth. All those bureaucrats need to fill their days somehow. Selecting, paying and controlling JAs would be a natural thing for them to do. The future? Who knows! But Sandstrom’s initial opening — which was far from a random riff — seemed designed to prepare these alumni volunteers for changes which they might not like . . .
Is the Entry an Anachronism? He cited the entry system as something that needs attention. What did he mean by this? While HWC has previously posted interesting arguments criticizing the entry/JA system for freshman (see this thread for previous conversation), for many of us, the Freshman housing system is one of the defining parts of the Williams experience. My initial instinct is that the entry/JA system is fundamentally the right one for Williams. It promotes class cohesion, provides some mixing between the freshman and junior classes that wouldn’t otherwise occur, and provides an instant social network for incoming freshmen (first years?). I’m willing to be convinced that I’m wrong. What do current students and faculty think? Are there tweaks to the current system that would make it better? Comments Off on Is the Entry an Anachronism? What advice would I readers suggest? July 9, 2009: Junior Anonymous – Coming soon to an EphBlog near you! Here’s hoping that we’ll hear more from her in future. This week, Williamstown is in the throes of a heat wave and my Frosh are in the throes of room draw. These two seemingly incongruous events are alike for one reason- they keep reminding me of things to come. For one, the fact that another summer is almost here. Also, that my Frosh are almost Sophs- my year as a JA is almost done. Two Thursdays ago, the lives of 52 Williams sophomores changed forever. My Co and I are lab partners. In two classes. The experience has taken our already married-couple-esque partnership to new heights, as we tackle chemical reactions with the same spirit of cooperation that we bring to the entry. He weighs our samples; I pour the liquids. I finish his sentences when our teacher asks us questions; he explains to our bench-mate how terrible I am with a calculator. We talk about paying the cable bill while assembling electrical circuits, discuss entry scandals while writing up our lab reports. So, I’m a day late on this January post… still running on Winter Study time, I guess. Maybe it’s just me, but Winter Study always seems to be the month that got away. I start it out with the best intentions, with grand illusions of catching up on my reading list and updating my resume and maybe finally cleaning my room. With only six hours of class a week, I always expect the free time to be endless. $250: Cash prize for IM Broomball Champion in January. Bring it on. It was 8:43 on November 14th when I heard the first rumblings. “It’s party time!!! !” the knocking on my door persisted. I heard Razor scooters rolling down the hallway, and knew it was no use. 2009 almost went down in history as the year without a Mountain Day. My Frosh were bereft, for a variety of reasons. Some had been looking forward to it for months, while telling friends back home about how awesome/inspired/utterly-insane their school was for having such a tradition. Some had been practicing a capella solos for weeks, while some were hard at work learning choral harmonies. Some were looking forward to dominating the Wah tournament, while some worriedly signed releases for the “Xtreme Adventure Race” (well I was worried, at least). Some anticipated reconvening with the mountains, while some had never seen the seasons change before. Some just wanted a day to sleep in. I will never forget the first time it happened. It was a Monday morning during JA training, the day that the First Generation students began arriving for their special orientation. None of my kids had moved in yet, but I could sense the electric energy on campus nevertheless. Everyone I saw, it seemed, could be a new freshman, could be one of the people that my fellow JAs had dreamt about and worried about for weeks. My Co and I had stopped by Paresky that morning, and I was innocently checking my mail when I noticed two girls huddled together, whispering anxiously. Suddenly one of them looked up and pointed at me. “Hey,” she said to her companion, “Ask her… she’s a JA”. For a split second I was startled, wondering what it was about my demeanor that had given me away. And then I looked down and realized that I was finally wearing it- the iconic purple shirt. With “Williams JA” emblazoned in gold on my chest (and, for what it’s worth, the name “Tiny Dancer” spelled out on my back), I finally looked the part of a REAL JA, even if I didn’t feel like one. Donning the purple shirt that first morning had been exhilarating- the shirt is, after all, the ultimate symbol of a position I have wanted for so long- but it had also been completely terrifying. The Admissions Office has a request. Admissions is currently looking for hosts for prospective Williams students. We need at least 60 freshmen/sophomores for the weekend of October 1-3. Incentive for Freshmen: The entry at the end of the year that hosts the most pre-frosh will get $200 added to their entry fund. The students who host deserve our thanks. Unfortunately, I have heard mixed reports about the quality of the hosting. Did any readers overnight at Williams as pre-frosh? What was your experience? Have any readers served as hosts? Tell us about it. I have heard some less than wonderful stories about a single host getting “stuck” with 3 or 4 pre-frosh and then being too busy to do anything at all with them. Are those stories outliers? How many pre-frosh per host is standard? The hosting process would be much better (twice as good? ten times as good?) if the incentives were better aligned. Tell students that the Admissions Office will keep track of who hosts how many pre-frosh and what sorts of experiences those pre-frosh have while at Williams. That information will be forwarded to the JASC (Junior Adviser Selection Committee) for any host who applies to be a JA. (The unstated implication will be that being an excellent host of many prefrosh will be treated by the JASC as good evidence that you would be a good JA.) Results? Though a few students have already arrived, today is when most of the Frosh hit campus to begin a new chapter in their lives. The JA’s have been in town since this past weekend; Ephventures leaders arrived on Monday, and others involved in First Days are still arriving. If you’re one to do this, say a prayer for Tiny Dancer and all of the other JAs who are about to embark on a year that promises to challenge and stretch them. I count many of them as friends, and my Facebook is all a’Twitter with their trepidation and joy as they prepare themselves to welcome the Class of 2013. Think back to that day, and how much you didn’t know about Williams and about your amazing peers. What personal advice would you give your freshman self today? For four whole days, crammed in between internships and travels and living life, I will exist once again within the boundaries of my hometown. And I could not be more thrilled. I still consider this place my “real” home, a fact that surprises me more than anyone. When I left for college two years ago, I was one of those kids eager to leave the nest, confident that I was ready for a new adventure, a new life, a new home. Don’t get me wrong, I’ve found all that and more at Williams. But at the same time, I find myself craving this place, my childhood home, in a way that I never imagined I would. This town, where I lived exclusively for the first seventeen-point-nine years of my life, is the backdrop to all of my memories. This house, where I lived for more than half my life, stores all the wonderful detritus of my formative years. This place, which I know more intimately than anyplace else in the world, is where my family is. And so this place is home. I feel like an expectant mother. This psychosis is fueled, I’m sure, by my admitted overindulgence in trashy television, namely MTV’s new trainwreck hit show 16 and Pregnant (EDIT: It has come to my attention that the Lifetime Original Movie is actually called 15 and Pregnant. My apologies). This summer I am living in a city where I know approximately seven people, give or take one US President (who I only know in my dreams). Do you really blame me for drowning my loneliness in reality TV? Coming soon to an EphBlog near you! Are you a prefrosh, wondering what exactly a “Junior Advisor” is, and why exactly they’re so cool? …Perhaps a current student, curious about the real world behind the iconic purple shirt? …An alum, eager to relive your glory days (“When I was a JA…”)? …Or maybe an Elton John fanatic, searching for someone to hold you just a little closer? Well, you’ve come to the right place! Except for you, Mr. Piano-Rock-Connoisseur. I’m not that kind of Tiny Dancer. Starting next week, I will be recording my life as a brand-spankin’-new JA on our very own EphBlog. In installments to be posted on the second Monday of every month, I will share with the world the ups and downs of a year spent living in the very same entry I inhabited as a First Year. And who am I? This thread raises the question about what attributes of the junior adviser/entry system are unique to Williams, at least among elite colleges/universities. Short answer: I don’t know! Long answer: Here are my guess as to items that are unique. 1) JAs are not paid by Williams. 2) JAs receive no non-pay compensation (i.e., room and board). 3) JAs are selected by other students, the Junior Adviser Selection Committee. 4) JAs are co-ed paired. 5) The 12:1 (?) student:JA ratio is very low. 6) There are many more applicants (100-150) for the JA position then there are spots available (52). 7) Since JAs are not employees of the College, they have many fewer obligations vis-a-vis reporting requirements then they otherwise would have. 8) JAs have an especially strong identity as JAs. They are much more cohesive as a group then students holding similar positions at other schools. Am I sure that these are unique to Williams? No. For all I know, the system at Bates or Stanford is exactly the same. Do our readers know which, if any, of these items are unique to Williams? Are there unique aspects that I am forgetting? Perhaps we could begin by listing schools that have any of these aspects. Unless you have arbitrary amounts of time to spend on obscure aspects of the debate over cluster housing, you should stop reading right now! But that’s a cool graphic, eh? 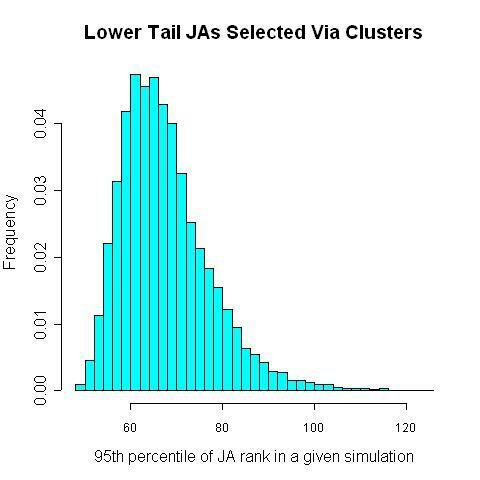 Short version: In the current set up, the worst JAs are ranked around 50. Under cluster selectiin, they would normally be ranked in the 60s, but, in unlucky years, significantly lower. Full details below. The op-ed in the Record from the JA Advisory Board includes even more fun stuff. It is our understanding from the CUL that the main (if not only) reason that the old system of random house affiliation failed was because students complained of being limited to just one house for their remaining three years. Hmmm. Has CUL actually said this publicly? Moreover, don’t the members of the JA Advisory Board read the Record? Virtually everyone agrees that the affliation system never really failed. Students just started trading their spots like crazy. They did not trade because they had a desire to move each year. They traded, I think, because a tipping point was reached wherein most sophomores — even those with affliation to Greylock or the Row Houses — decided that they wanted to live in Mission. This led to an active market in swaps (what senior in Mission wouldn’t trade her pick for a Row House room?) that benefited all concered. Free agency arose from the natural interactions of students seeking the best possible housing system. An emergent system, right there in Williamstown. Once it became clear students wanted this — wanted a world in which sophomores congregated in Mission, juniors in Greylock and seniors in the Row Houses — it was obvious to all concerned that crazy trading was a stupid, inefficient and unfair method of running things. A campus wide lottery would clearly lead to the same outcome at lower hassle and more fairness for all concerned. The missing piece of history in all of this is what happened in Mission from 1988 to 1993. Do we have any readers who know the story? How did Mission go from 30% sophomores to 90% sophomores in just a few years? How was the tipping point reached and when did it occur? There is a great story to be told on this . . .
Hmmm. I seem to remember that, back in the day, this was an official, albeit sotto voce, policy. If it isn’t, shouldn’t it be? I think that if a JA sleeps with a first year, he has demonstrated such a profound lack of good judgment that his ability to handle other aspects of JA’ness is called into question. Why keep him on as a JA when there are so many excellent candidates to replace him with? I don’t believe that he should be punished or fined for this transgression, but he certainly does not deserve to stay in a position in which first year women look to him for guidance and advice. Empirical question: How many JA’s have become romantically involved with first years this school year? EphBlog is powered by WordPress and delivered to you in 1.137 seconds using 37 queries..